Lots of fun and challenging activity sheets for Muslim kids about Ramadan & ‘Eid ul Fitr! Enjoy the coloring sheets, word searches & fill in the blanks! Make sure to eat sensibly during Ramadan… especially at iftaar. When fasting, make sure to read lots of Quran and stay away from sins and useless activities! Hey kids! Suhoor (Sehri) is a very important part of fasting. So, make sure to wake up early to have your suhoor and don’t wait till the last minute! Here’s a nice Ramadan Coloring page! Make sure you make your intention to fast before the time of fajr prayers! Alhamdulillah, we are very pleased to introduce our very first printed activity book, ‘Mariam & Fuzzball Learn About Ramadan’! Order your copy today! 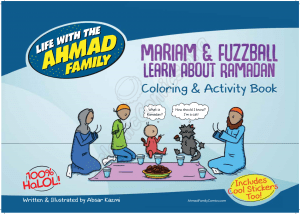 Mariam is curious about Ramadan and fasting, so she asks her friend Fuzzball what it’s all about… Enjoy coloring in this Islamic activity page! Ramadan is all about sharing what you have with others! Make sure to share your iftaar with your neighbors and friends. It’s a great way to tell them about Islam! Mariam and Umm Jamal are shopping for Ramadan. Help them pick out the best foods for this glorious month! Do you know why we fast? Mariam is wondering the EXACT same thing! This Activity Sheet will help you understand insha Allah!